Have you ever had a dentist and an assistant argue on top of you as they’re trying to complete your root canal? We hear time and time again about how a negative relationship between the assistant and the doctor can make a trip to the dentist more unpleasant than it has to be. For one reason or another, the idea of culture has been neglected in most dental offices. This results in a trickle down effect that makes the work environment negative, and causes the patient experience to be awkward and uncomfortable. Furthermore, unhappy docs tend to make more incorrect treatment decisions. A study was conducted with physicians, and it measured how happiness correlates with the ability to reach a correct diagnosis. The results showed that there was a direct positive correlation between the two: happier doctors were able to diagnose better and faster than their counterparts who were not reported to be as happy. You want your dentist to be happy. At Morton Ranch Dental, we’ve created a culture based on mutual respect. 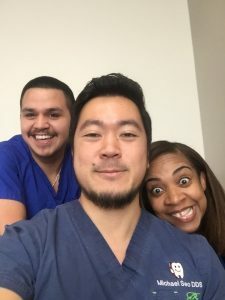 We believe that work can be fun, and it shows in the way that we treat our patients and do our work. We know how to laugh, but we also know how to get the task done. That’s the difference you’ll feel at Morton Ranch.